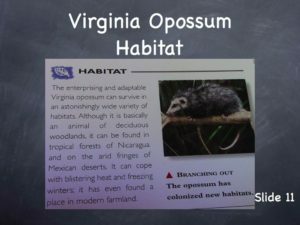 This episode explores animal habitat, featuring Virginia Opossums, Raccoons, and Squirrels as examples of highly adaptable animals that have their habitat needs met is a great many regions. Click here to see all of Episode 51- Animal Habitat. If you prefer to watch this episode in three shorter segments, we have that set up below. 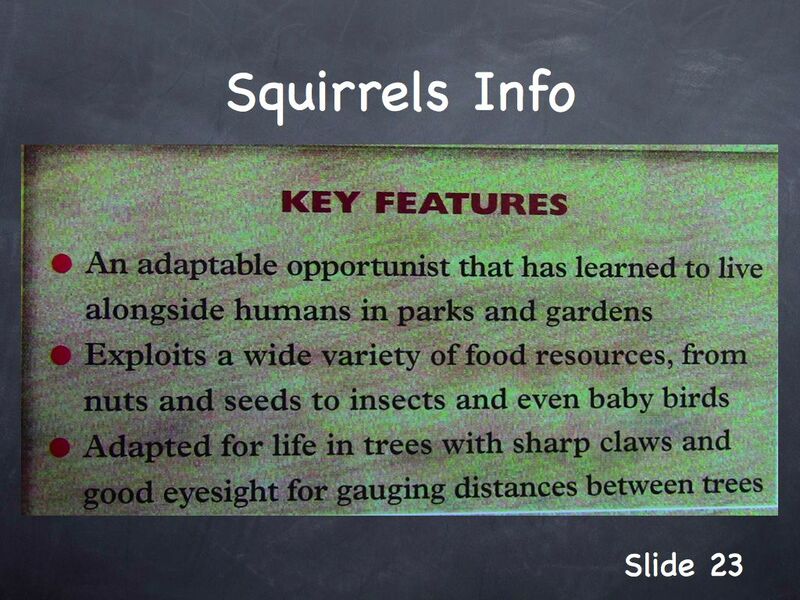 Use appropriate words and phrases to describe a landscape in terms of an animal’s habitat needs. 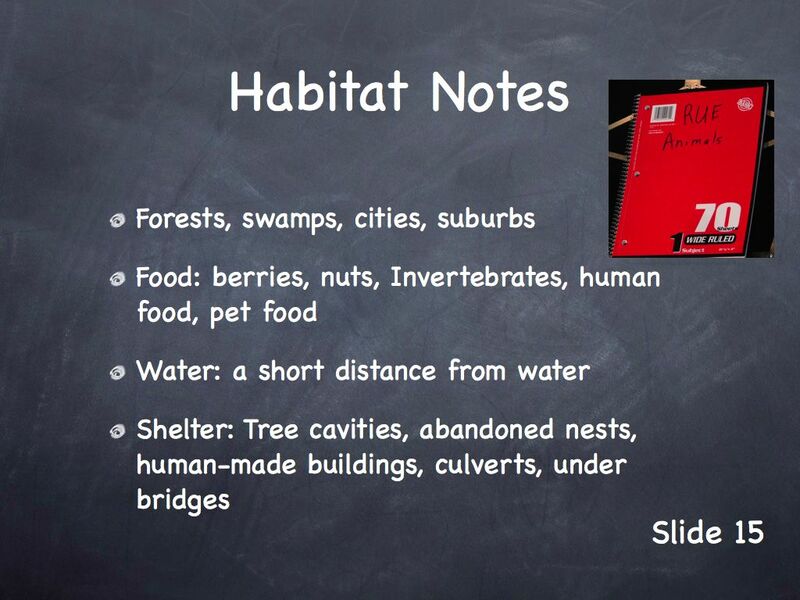 Explain how an animals habitat needs are met by certain natural environments. 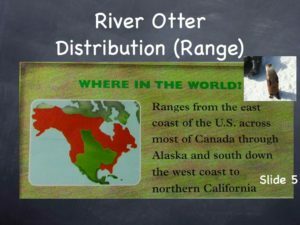 Life Science: Distinguish between an animals’s range and its habitat. 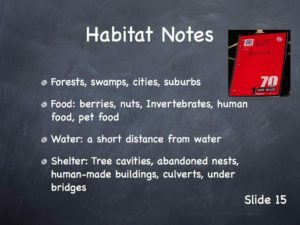 Explain how an animal’s habitat effects the range of the animal. 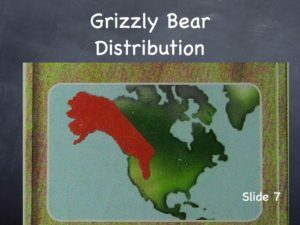 Connect an animal’s habitat with the distribution of said animal. 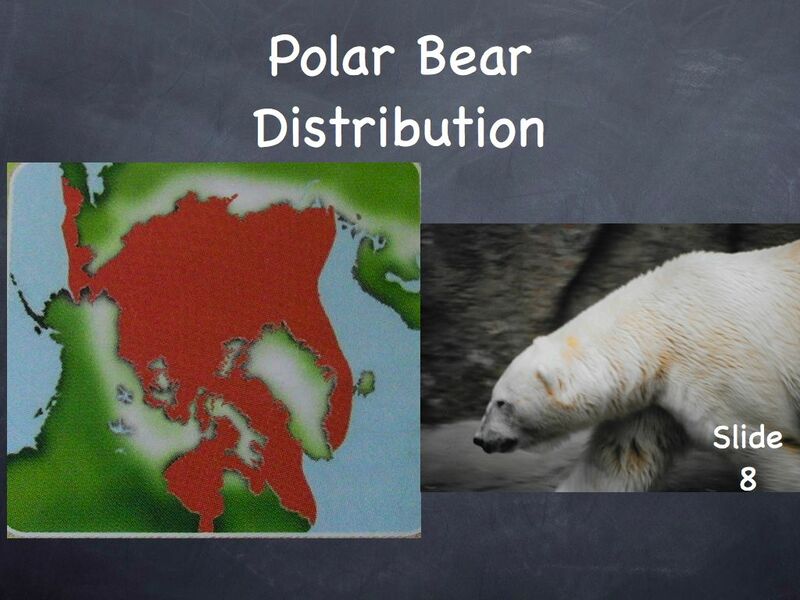 Explain how an animal’s adaptability could effect its distribution and range. 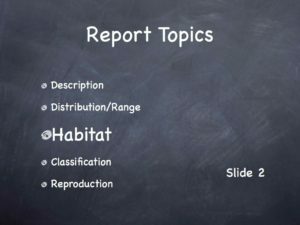 List the four habitat needs of all animals. Still haven’t chosen your animal to research? These links can help you decide and they can provide the information you’ll need to research and report on the animal you choose. If you’re still a child or you just want a more simple source on animals, click here for the San Diego Kid’s Zone. If they have the animal you’re researching, the site should work well for you. If they don’t have info on the animal of your choice, try here. 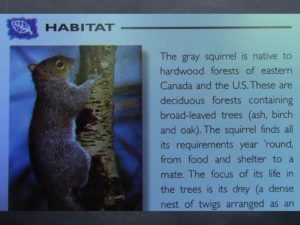 If you want a more detailed source of information on the animal you’re researching, click here for Wikipedia. Then enter the name of your subject in to search box. You can find information in languages other than English. Click on one of the languages after going to this page. 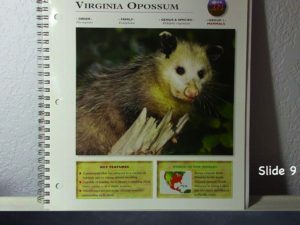 Click here to watch the Virginia Opossum Video. The habitat needs of all animals can be summed up in four elements: food, water, shelter, and space. Highly adaptable animals like Virginia Opossums, raccoons, and western gray squirrels can get their needs met in a number of habitats, including those affected by humans. 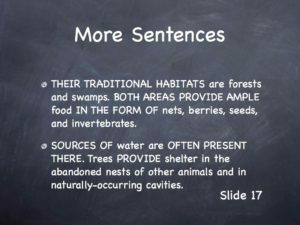 When describing an animal’s habitat, there are words and groups of words that can be used to introduce and connect facts about an animal’s habitat. 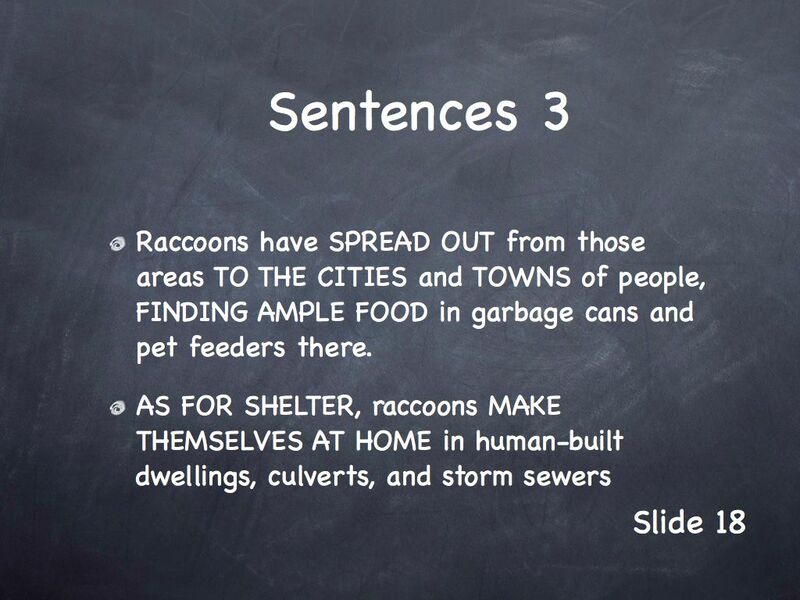 You’ll see these words and phases used in the instruction slides below. Furthermore, there’s a link that can often be seen between an animal’s habitat needs and its distribution and population. 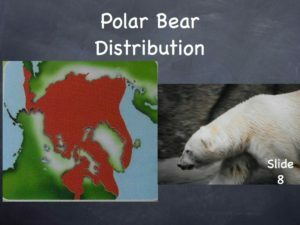 More adaptable animals are often widely distributed in term of geography; whereas animals with low adaptability are often restricted in tern of distribution and range. 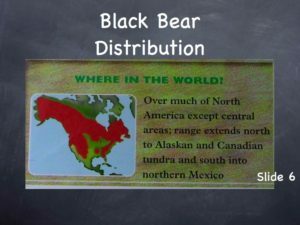 Notwithstanding the link between habitat and range (or distribution), these are distinct concepts. Habitat is not a place on a map; rather it’s an environmental resource for the habitat needs of an animal. 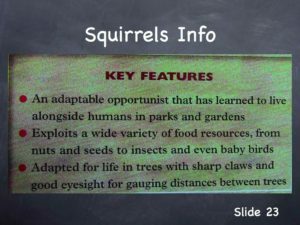 When we say “the habitat of a Western Gray Squirrel” we refer to an area with trees and the types of food this squirrel needs to eat and store for the winter. Those resources could be in a variety of geographic locations. 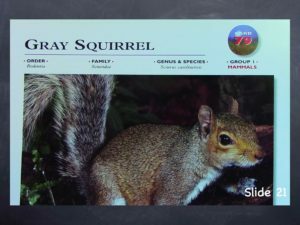 In this episode and others, we feature wildlife cards as the resource I use to demonstrate gathering information about an animals. 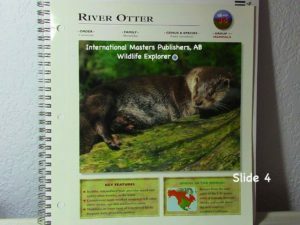 This excellent resource is published by International Masters Publishers AB and are used under Fair Use doctrine for educational purposes. Then Wildlife Explorer (registered Trademark) series includes hundreds of these cards purchased by subscription. You can visit their website at www.imponline.com. 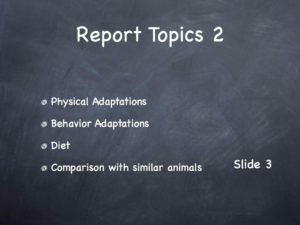 These are some of the elements that need to be in a report on an animal. Click on slide to Enlarge it. Use the back arrow to return to the Episode 51 page. 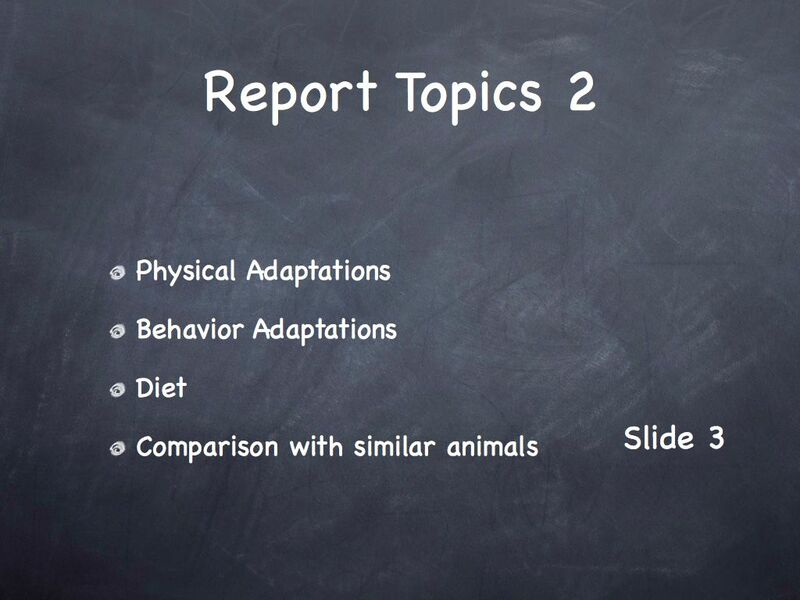 These are more research topics for the animal report. We find information about the distribution of River Otters on the cover of a wildlife card. 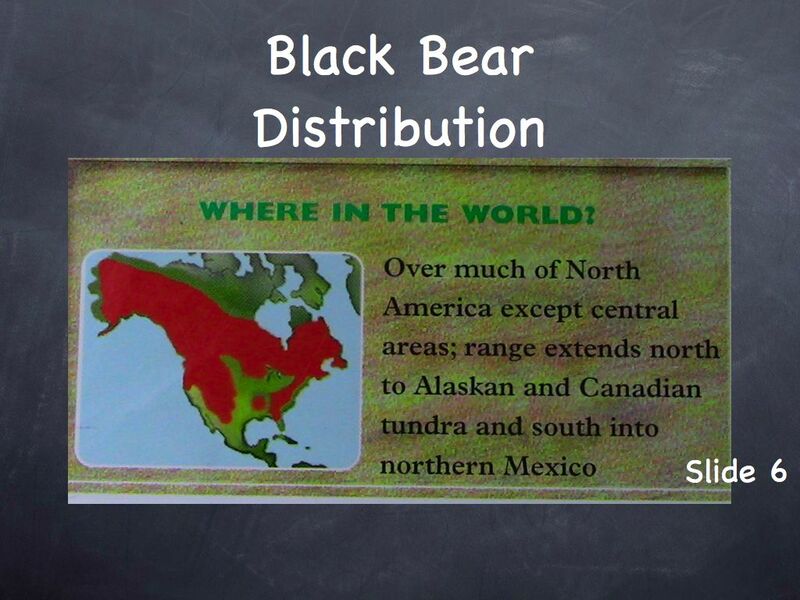 This map shows the wide distribution of Black Bears in North America. This closeup shows the otter’s range, shaded in red on the map. Compared to American Black Bears, the Grizzly Bear (aka Brown Bear) has a limited distribution. 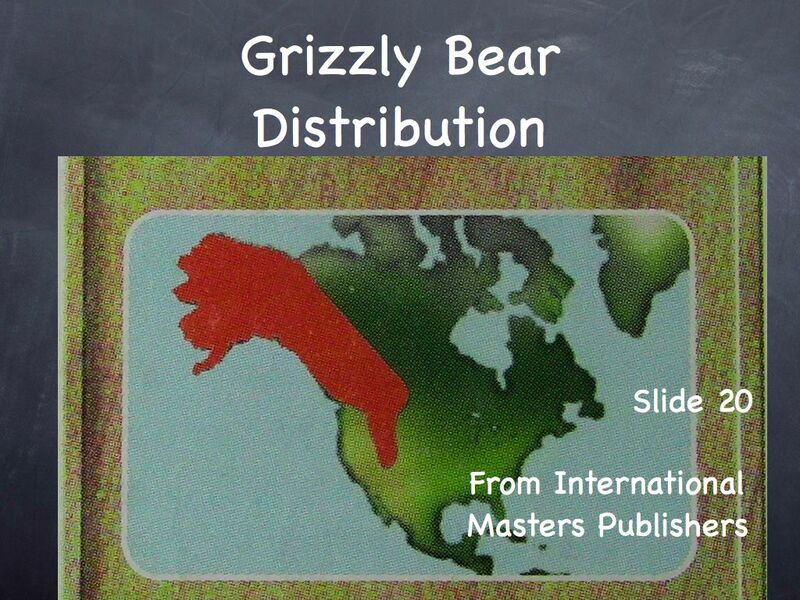 This map shows Polar Bear distribution. The front of this card shows the distribution of Virginia Opossums. 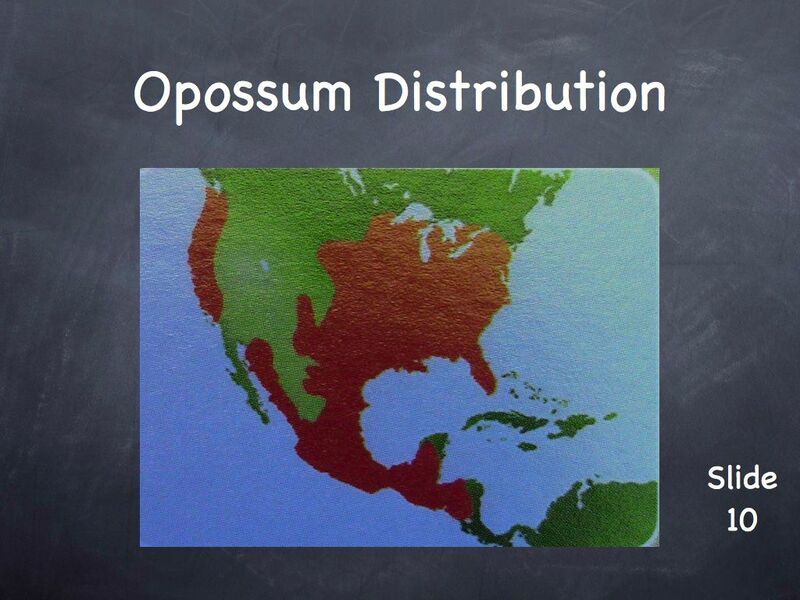 A closeup of the map shows the opossum distribution. 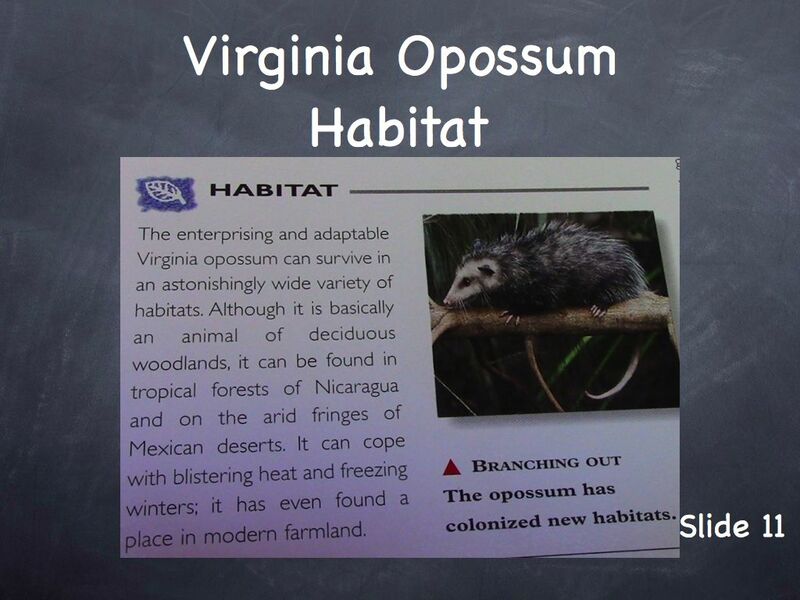 Inside the card, we find information about the Virginia Opossum’s habitat. 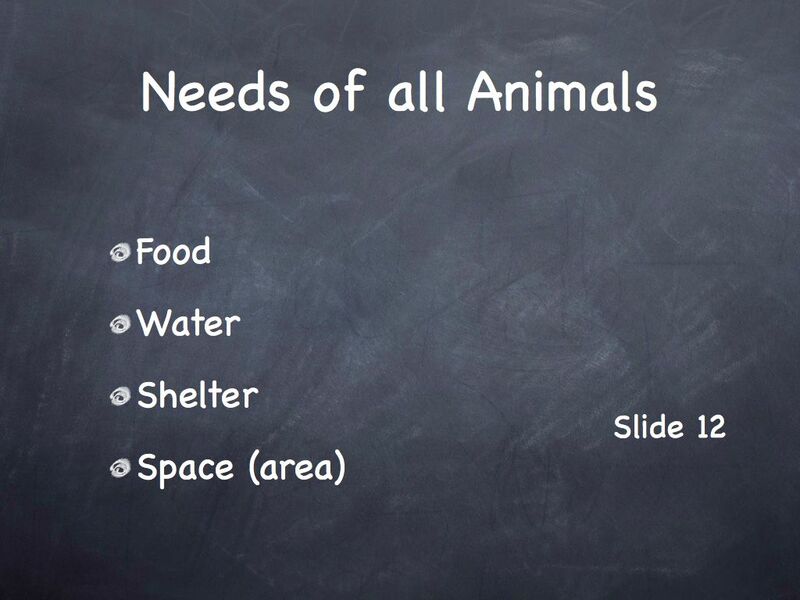 We review the four needs that the habitat of every animal must meet. 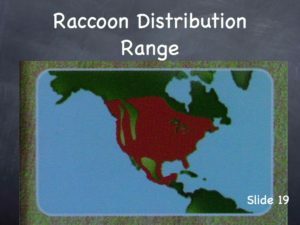 Here’s the range of raccoons. 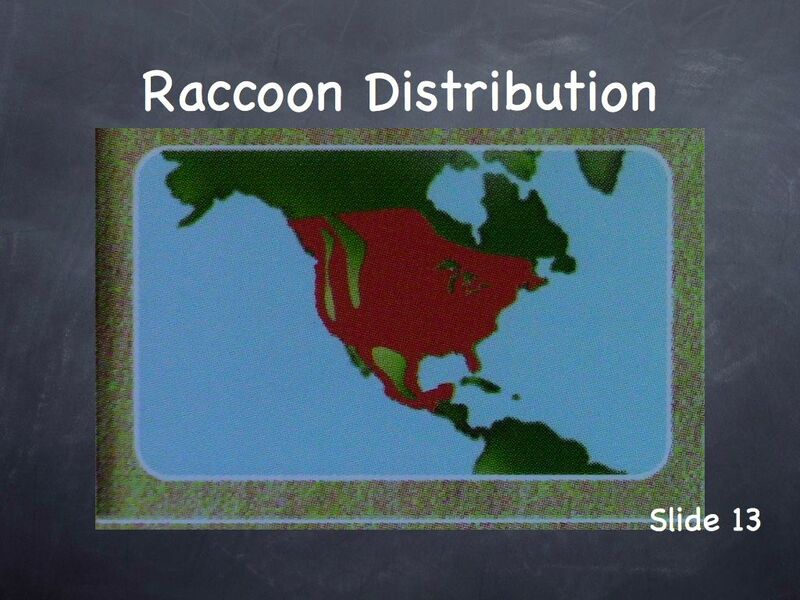 Seeing all the red shading, we can see that raccoons are widely distributed in North America. 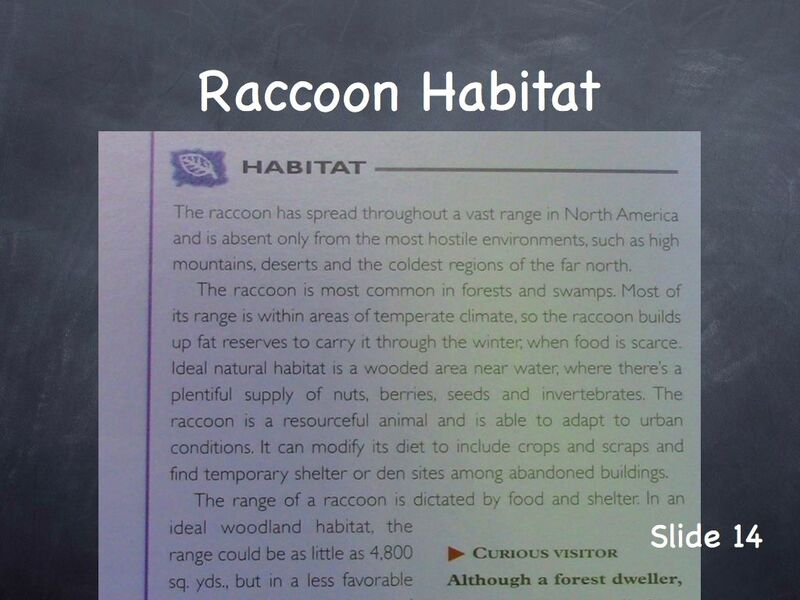 Here’s information about raccoon habitat. 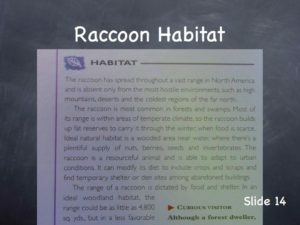 These are notes we could take from the wildlife card. These are sentences we could write from those notes. 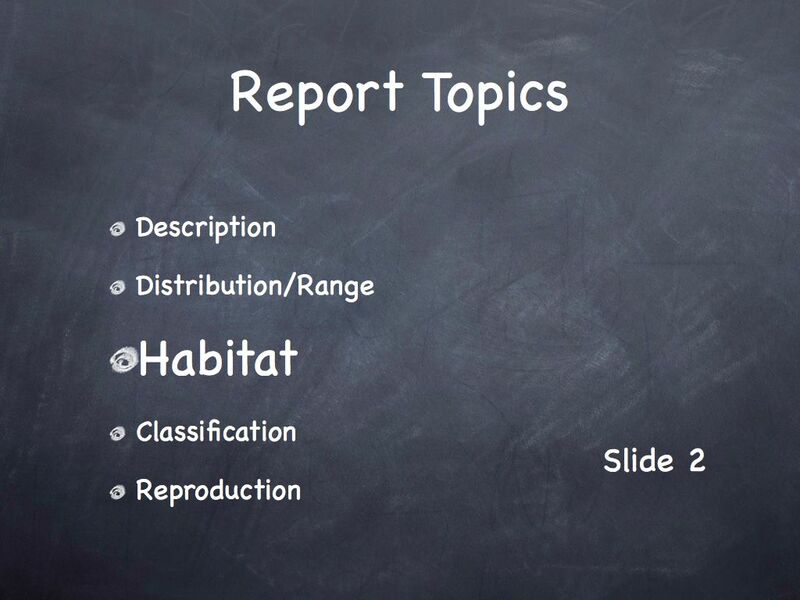 The connecting words for describing habitat are in all caps. 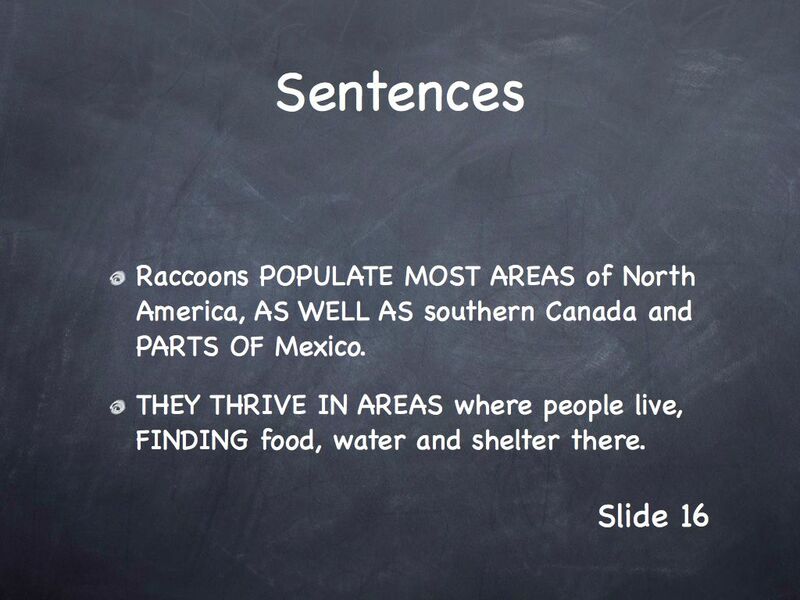 These connecting words can be used to describe the habitat of a wide range of animals. 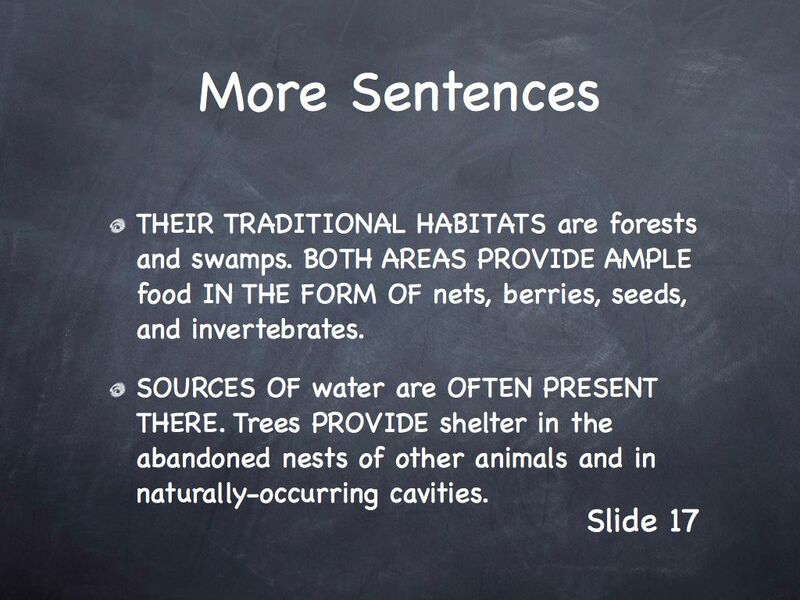 Here are more sentences describing habitat. Note the words in all caps. 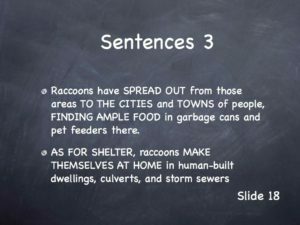 Yet more sentences and connecting words. These words should be kept in the learner’s notebook for future use. 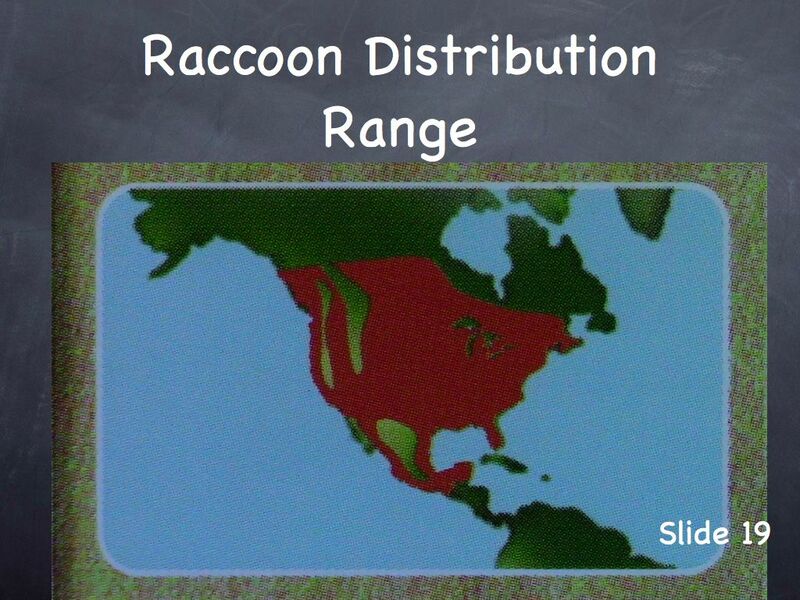 We use this map to explore the link between habitat and range. We consider reasons for the Grizzly Bear’s shrinking habitat. 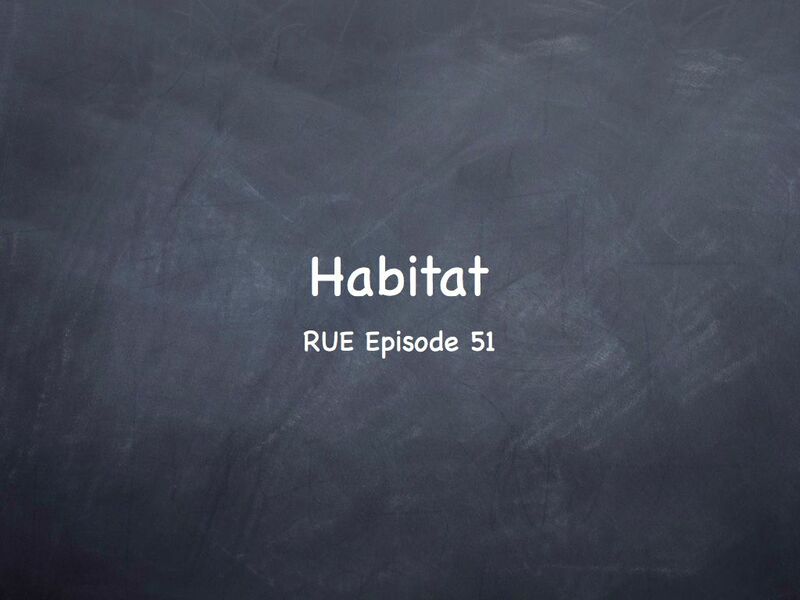 In Episode 52, we go beyond habitat to learn about biomes. Click here to visit the Episode 52 page.